The research within our LUMC departments is conducted within departmental research programmes. The research programme below is embedded within the Center for Proteomics and Metabolomics. The Center for Proteomics and Metabolomics is a Technology Focus Area (TFA) of the LUMC. The CPM aims at developing and implementing cutting-edge proteomics and metabolomics methodology and technology for analysing disease-associated molecular mechanisms and fingerprints within all research focus areas of the LUMC, to promote innovation within biomedical research and public health. 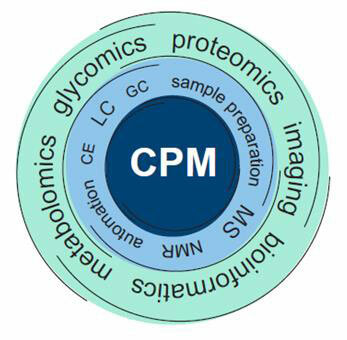 The CPM houses MS- and NMR-based technology and expertise, distributed over 5 groups: proteomics, glycomics, metabolomics, MS-imaging, and bioinformatics. The CPM has the ambition to continuously push technology and methodology forward while maintaining reliable and efficient support and collaboration with our research partners. We strive to deepen research collaborations with academic groups, including national research centers and platforms, to develop, implement and apply new analytical tools, biological model systems and informatics methods. In addition, we pursue collaborations with industry to apply and adapt the latest state-of-the-art technology in robotic sample preparation, liquid separation methods, mass spectrometry and NMR, within the scope of biopharmaceutical development and biomarker discovery. We train and educate students and scientists within the LUMC, as well as bachelors and masters from outside. The CPM is internationally recognized as an expertise center for mass spectrometry, NMR and bioinformatics. Members of the CPM are well-established in the international scientific community leading to collaborative projects. CPM members are frequently invited to give lectures at conferences and meetings, and asked as external reviewers for international PhD theses or grant applications. The CPM has a strong track-record in coordinating and participating in international scientific research networks. CPM coordinated the FP7 Heath project HighGlycan, and currently coordinates the Horizon2020 ITNs GlyCoCan and GlySign. CPM participated in the FP7 Heath project IBD-BIOM and currently participates in the ITNs IMforFUTURE and A4B, in both cases as work package leader. Within these networks and beyond, a large number of international pre- and post-doctoral students come to our lab for training and research purposes. The CPM brings together state-of-the-art infrastructure and (international) scientists with backgrounds in physics, chemistry, biology and (bio)informatics to participate in many basic and translational research projects where mass spectrometry (MS) and nuclear magnetic resonance (NMR) are used to unravel key physiological and cell-biological processes underlying pathogenesis and disease progression with both temporal and spatial resolution (Figure 1). Studies at CPM are focussed on (high-throughput) analysis of a wide array of biomolecules (e.g. peptides/proteins, glycans, metabolites, lipids) in the fields of (glyco)proteomics and metabolomics, with strong emphasis on the development and implementation of automatic sample preparation techniques, and state-of-the-art MS and NMR technology. MS is either used stand-alone or coupled with separation techniques such as gas and liquid chromatography or capillary electrophoresis. A highly valuable asset of the CPM is the mass spectrometry imaging line, which allows the direct, and untargeted analysis of diverse analytes in tissues while maintaining their spatial distribution. Interpreting the large amounts of analytical data relies heavily on specialized in-house developed (bio)informatics tools. The CPM has a core of permanent staff maintaining the expertise in the analytical technologies (LC, CE, MS, NMR) that underpin the applications in proteomics, metabolomics, glycomics, MS-imaging and bioinformatics. These in turn support a wide range of collaborators in diverse fields, with a strong emphasis on biomedical and clinical research involving partners within the LUMC. The innovative character of CPM activities contributes to the life-science and, in particular, the biomedical and clinical research within all the medical research profiles (profileringsgebieden) of the LUMC (see “Cohesion within LUMC”). CPM activities contribute to LUMC research in different ways: i) CPM works on fundamental research questions in biomedical sciences in a hypothesis-driven way, and ii), CPM research is often positioned in the discovery phase of studies, in which large groups of biofluids (e.g. serum, urine, CSF) and tissues from clinical cohorts are analyzed aiming for the translation of results and/or methods for diagnostic or therapeutic purposes. Precision Medicine and Personalized Medicine approaches increasingly rely on patient stratification by large-scale patient genotyping and phenotyping. This includes molecular phenotyping of patients applying proteomics and metabolomics on biofluids and liquid biopsies. The CPM aims at contributing to these approaches with its high-end mass spectrometric and NMR analytical facilities to provide the development of novel diagnostic and patient stratification approaches as well as drug leads and targets. For the latter topics we have established close collaborations with national as well as several international collaborators. Specific topics include, the modulation of lipid metabolism as target for non-alcoholic steatohepatitis (NASH) as well as the function of neuronal guidance proteins during inflammation and immune cell development. The group’s research strategy evolves largely around the technological needs within the LUMC. In this function the CPM provides state–of-the-art molecular analysis techniques, which are continuously improved, adapted and expanded. However, the CPM does not see itself as a pure service department, delivering data by payment. Instead, CPM is a technological partner who accompanies a project from study design to data analysis and interpretation. As such it is not only necessary to keep analytical approaches up to date, but also establish the CPM as a center of expertise including study design, data analysis and interpretation. Particularly for the latter points a close collaboration with our partners, including frequent knowledge exchange and discussion are inevitable. An ideal management instrument to achieve such close interaction are joined PhD students, jointly supervised by CPM and its partners. The research of the CPM is focused on the elucidation of molecular mechanisms of diseases and disease-associated molecular signatures using MS and related techniques. The activities are embedded in all medical research profiles (profileringsgebieden) of the LUMC. The CPM contributes to innovation by the development and implementation of cutting-edge technology. The application of this advanced technology provides an innovative – and often essential – dimension to LUMC research.